Themes: music, painting, art, The Arts, imagination, creativity, friendship, feelings, nerves, resilience. 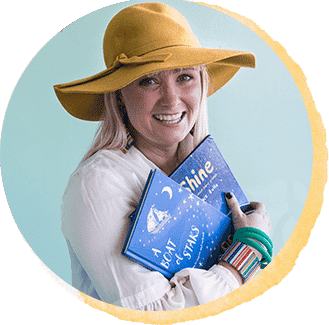 Author Zanni Louise adds a touch of whimsy to all her writing and her ‘Tiggy and the Magic Paintbrush’ series is no exception. Tiggy is a plucky little protagonist who has a huge imagination and some equally large feelings! 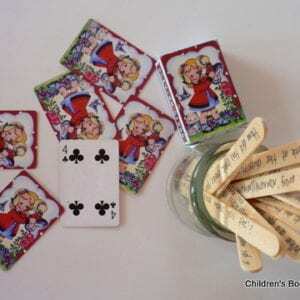 Her magic paintbrush helps her to paint her way out of some tricky situations, but really the magic is inside Tiggy herself – just like it is inside us all. The Tiggy books are perfect for early independent readers who like the support of illustrations and enjoy a storyline that is engaging but not overly complex, in order that they can experience success with their first forays into reading. The series would also be a great read aloud for little people who are ready to listen to a longer narrative. 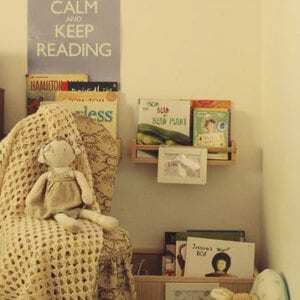 I have been following the work of Zanni Louise for some time now and have her picture book ‘Too Busy Sleeping’ on my list of top books for preparing for a sibling, and ‘Errol’ on my ‘Best Books for Toddlers’ list. You can find all books by Zanni Louise here. 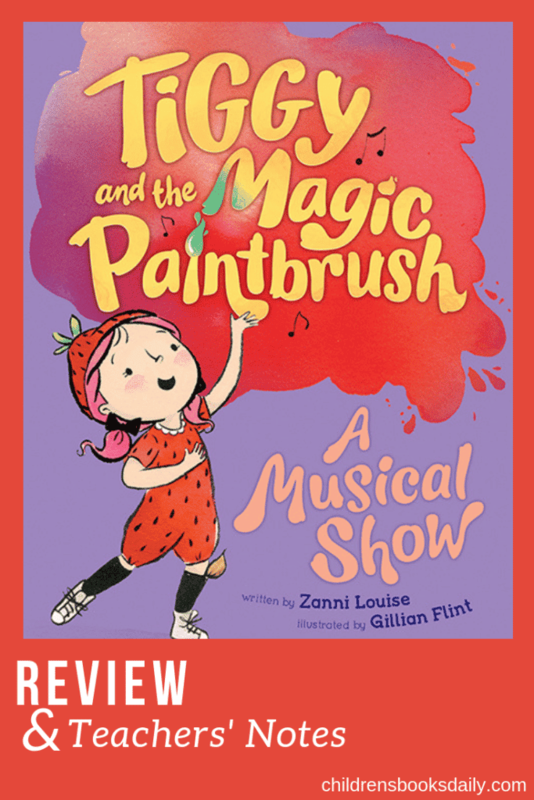 Below Zanni introduces the ‘Tiggy and the Magic Paintbrush’ series. Click on title links or cover image to purchase. Teachers’ Notes prepared by teacher Melissa Kroeger for Children’s Books Daily in context with the Australian Curriculum. 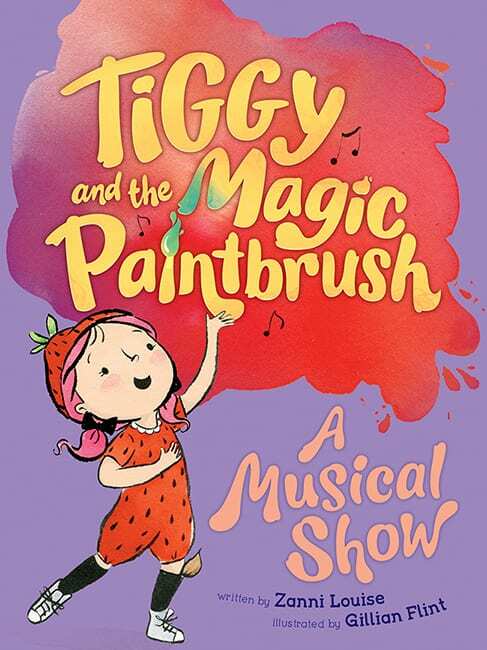 Today is the Fruit Salad Performance at Tiggy’s school, and Tiggy is the star of the show! But when nerves creep in, Tiggy’s voice gets croaky. Oh no! Lucky Tiggy has her magic paintbrush with her – but can it help her find the right voice to save the show? Can you see her paintbrush? What do you think Tiggy is doing? What do you think Tiggy is dressed up as? What is a musical show? What do you think the musical show will be about if Tiggy is dressed up as a strawberry? Can you find the second paintbrush on the front cover? There is a big splodge on the front cover – what is the illustrator trying to represent? What would it be to have a ‘big imagination’? What would it be to have ‘big feelings’? What types of fruits would you find in a fruit salad? What is Felix dressed up as? Is Poh dressed up? Why not? What does it mean by ‘when nerves creep in’? What has happened to you when you have been nervous? How did your body feel? What happened for you to feel nervous? Did you have to perform on stage too? Why would Tiggy’s voice become ‘croaky’? What do you think is meant by ‘the right voice’ to save the show? What do you think Tiggy’s magic paintbrush can do? The illustrations on the back cover show everything in colour except for Tiggy and her friends. Why do you think that is so? Identify actions that promote health, safety and well-being. Discuss with your students what healthy and unhealthy foods are. Draw a table with two columns on the whiteboard/ large piece of paper with one side titled ‘Healthy’ and ‘Not so Healthy’ and also represented with a ‘thumbs up’ and ‘thumbs down’ for understanding. Ask students to suggest foods and where they can be placed on the table. Draw pictures of the food next to the text to help understanding. Explain how these foods can be ‘always’ and ‘sometimes’ foods. Considering viewpoints – forms and elements: For example – How did the performers use their voices? What sort of movements did the performers use? What voice and movement have you noticed in others’ performances that you might consider in making your own drama and why? Have students memorise their couplet in their pair. Encourage students to help make up actions to their couplet that could help to represent their fruit or vegetable, or just some fun actions. Record student’s performances and watch with them (or as a whole class). Discuss if their voices are clear. Discuss if their actions are well formed. Encourage them to critique and improve if necessary. Considering viewpoints – meanings and interpretations: For example – What did this artwork or design make you think about and why? What figures/shapes can you see in the artwork? How has the artist treated the figures/shapes to convey their idea or meaning? Using large pieces of white or brown paper approx. 80-100cm x 30-40cm, fold in half and cut out a head hole at the fold. Then cut to shape if required eg: round for apple, long and thin for a banana. Staple down sides if required but make sure student can get in and out of the costume. Discuss with students what colour their fruit or vegetable is. Research if necessary. Have students paint their costumes in the appropriate colours. If necessary talk about details in the fruit such as seeds or stalk and paint the details on. Paper hats could be designed too, just like Tiggy’s. Practise and perform your show. This could be done at assembly/ to parents/ individual classes etc. Learning Continuum of Critical and Creative Thinking, Self-Awareness Element, under the Australian Curriculum. Discuss with your students how Tiggy has feelings of nerves and how she overcomes them. Have you ever felt that way before? What was the situation you were in? What might be some ways to overcome those types of feelings?